This is my tenth growth report on OliverKenyon.com. I use these reports to share my progress updates from both a business and a personal point of view. You can view my previous reports here. Finally, we managed to close our first round of investments on “Project P”. We’re still at very early stages so I can’t reveal anything about the new start-up JUST yet; however, I’m so happy that we finally closed our first two investors. It was a great experience for me, as this was the first time my business partner Andy and I completed an investment round firsthand. We wrote the pitch, we had the meetings, we drew up the shareholders agreements, and we closed the deal! We truly believe we have two incredible people onboard, regardless of the financial impact they both made, and I CANNOT wait to reveal more details with you in the coming months! April was another busy month all around, and I constantly find myself learning new things month to month as I progress my businesses. Lots of April was spent dealing with solicitors, lawyers and accountants. For me, it’s still quite surreal and “new”. Let’s not forget it was only a few years ago that I was working full-time as a chef. In April, we closed 6-figure investments for our new start-up! Lovecars took a bit of a back seat for me personally in April as I was focusing on getting our “Project P” investment over the line; however, it had still been an incredibly busy month for the team. We did manage to thrash out a few all-dayers, which are by far the best way to action progress on the project. It’s when we all lock ourselves in a room for the entire day with no distractions. I spent a large amount of this month working alongside our main developer to finish off the discussions or forum side of things on the site. Obviously being very experienced with forums, I mapped out a very similar setup with the xenForo forum software but integrated it into our Lovecars UI/UX and feed. We plan to open the discussions to the public this month. Aside from that, the team and I have been having several meetings, conferences and plans with different app building companies. If you’re looking to have an app built, then I found a great resource here. We’ve narrowed it down to two companies and plan to proceed with the development side of things in May. The ideas and wireframes we have for the app are incredibly exciting and we feel it will really put us on the automotive map. 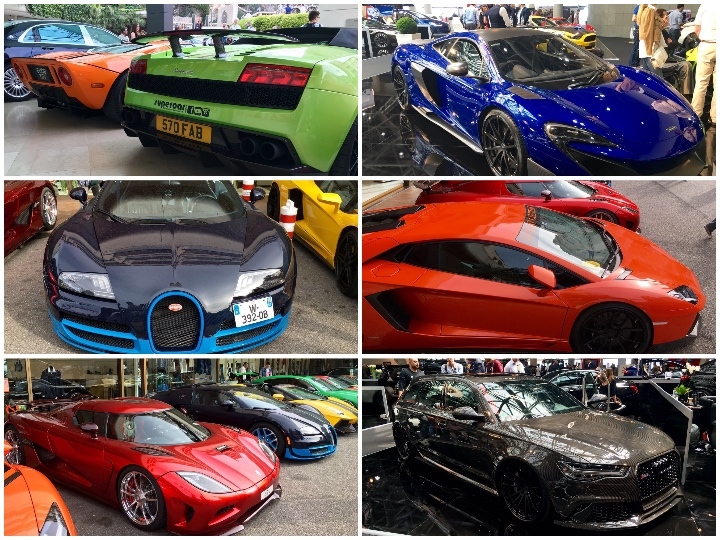 The external team has also been incredibly busy this month and has thus been visiting lots and lots of exclusive car events to get us the lowdown of what’s going on in the car industry. As you can see from the above, we are lucky enough to have unprecedented access to the best cars in the world and are always updating our news pages with the latest events and happenings. 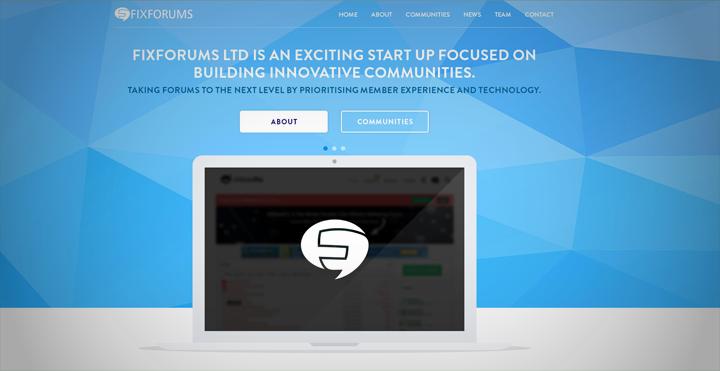 The FixForums company just keeps getting bigger and bigger and feels like it’s growing at a rapid pace. We completely smashed April’s profits last month and I’m super excited to see what the rest of the tax year has to bring. We’re predicting a huge, huge rise in profits and growth! I was lucky enough to be invited by one of AffiliateFix’s partners Instaforex to watch my beloved Liverpool play in the Europa League! I’ve been working alongside their fantastic team for several months now and when they contacted me offering me four VIP tickets to the game, I was jumping up and down in my office with joy. I’ll touch on this a little more below in the personal section, but you can read the full write-up here, and I also want to give another huge shoutout to the guys over at InstaForex for believing in what we’re doing on AffiliateFix.com. In other forum news, we were lucky enough to host our third ever Entrepreneur Expert Week on EntrepreneurFix in April alongside special guest Pejman Ghadimi! 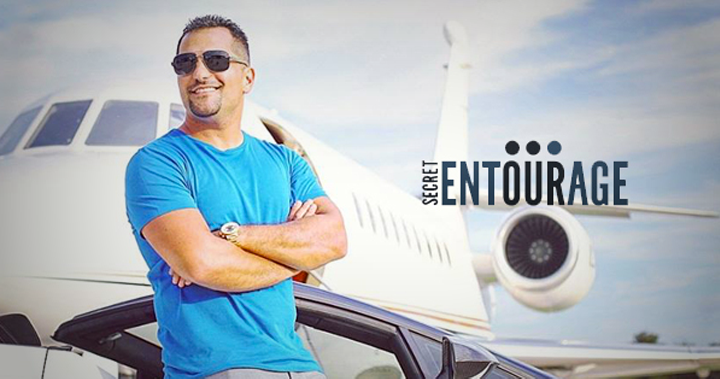 For those of you who are unaware of who Pejman is, he’s the founder of the prestigious Secret Entourage and the author of the best-selling book: Third Circle Theory! Pejman kindly offered his services for the week and made his way through lots of great questions from our members. You can view his Q&A by clicking here. April also saw us add an additional forum and resource section to AffiliateFix. We’ve now added the Coaching, Programs and Courses forum to be the go-to place for honest reviews and information regarding affiliate marketing coaching programs. We expect to grow this resource section a lot in the coming months. TJ has been busy working on making sure we have the right and – most importantly – active moderators across the forums, which has been a slow but very important process. So, welcome all you new moderators to the FixForums team. Not yet live, but ready. If you remember back in March’s report, I told you we’d been working on some new things. Well, the website is ready and our very first plugin is almost ready for sale. All we have to do is finish the plugin and package it up and it will be launched in conjunction with our new website hopefully in the coming weeks. We’re really excited to launch our very first premium plugin and it’s great encouragement that we’ve already gotten 10-20 people wanting to buy it! This is a plugin that will help many store owners with their CRM and payment gateway integrations with LimeLight CRM. Speaking of LimeLight, we’re still waiting for our good friend Rick to send out the email blast we designed last month. We’re hoping it will go out this week but it should (touch wood) bring us in a lot of new clients and work. We’ve been very busy with our repeat client work this month, but we will be ready to do some outreach for new clients following the email blast from LimeLight. It’s business as usual over at Landing Page Guys and the only other significant thing that happened in April is we had someone approach us wanting to buy the company, which was VERY flattering. However, for us at this stage, the timing isn’t right with what we have going on behind the scenes. More will soon be revealed. I was particularly happy with my post regarding getting started in lead generation as it received some really high praise across multiple social platforms and affiliate forums. I like being able to have an archive of posts I’ve written, as I mostly write about things I get asked about a lot, so I now have a great source of content I can share with people. Instead of spending hours trying to explain something to someone, I can simply send them a link to my blog. It’s great! We made a few visual additions to the blog this month, most obviously the new sidebar and after posts widgets that link to other blog posts on oliverkenyon.com. I’m hoping this encourages people to spend more time on the blog and soak up related guides and information. What do you think of them? I’ve obviously written a full report on my trip to Anfield, but another highlight for my blog last month was when IntsaForex contacted me to tell me that they, along with the Liverpool FC club, were so delighted with my write-up and report that they would like to invite me back this Thursday for the semi-final. I must admit, as sad as it sounds, you can take all the money back. That was the highlight of my entrepreneurial journey so far! I plan on spending some time this month analysing my blog, stats and visitors in order to make some improvements as we approach a year of blogging! WOW, who’s been reading since month one? So obviously my Liverpool trip was business-related, but it had a huge personal connection for me too. The fact that my Dad and I went full circle was awesome, as this time I was able to take him to a game at Anfield like he used to take me. 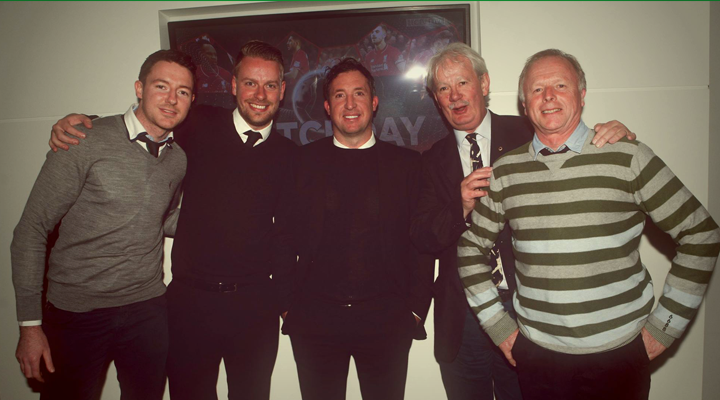 The fact that it was VIP and we met loads of Liverpool legends was even better! I hope he was proud of how far I’ve come and I can’t wait to share more Anfield nights with him! Another amazing trip was just this past bank holiday weekend when Josie and I travelled to London for the day/night with our friends Nick and Sara. I’d booked a night away on a luxury boat on the Thames for Christmas as a present to them all and it didn’t disappoint. We travelled up in the afternoon and arrived on our boat. It was awesome! If you ever want to do something like this, then here’s the link to the boat we stayed on. The owner is great and the location is amazing. 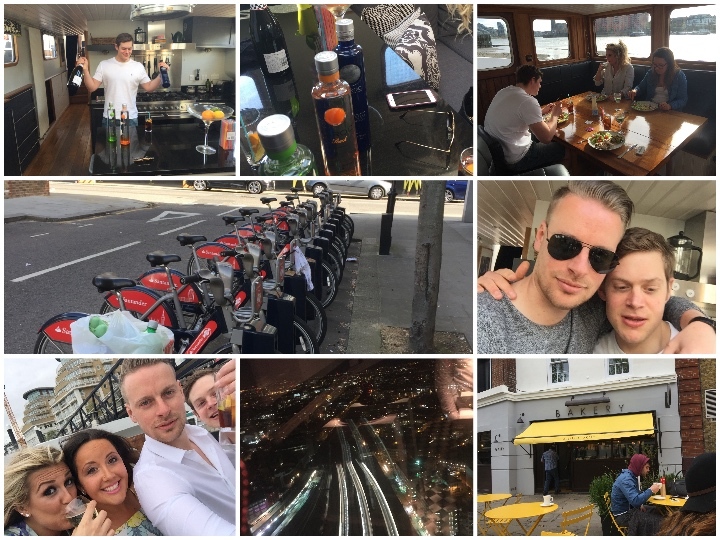 Nick and I picked up a couple of bikes and rode into Chelsea to grab some food whilst the girls sunbathed, enjoying a little drink or four! Once we got back, we had a great few hours playing games and drinking champagne and Cîroc before getting ourselves dressed up for a night on the town. We then grabbed an Uber to Canary Wharf where we enjoyed our first ever visit to The Shard. We had dinner booked on the 32nd floor, and it was incredible! The view was too good to describe and our pictures don’t do it justice. All I will say is, if you’re in London, it’s a must-do! Even if you don’t eat, just go to the bar and have a drink and admire the view! Make sure you book in advance. The next day, we spent hours drinking tea and eating cakes after stumbling across Gail’s Bakery in Chelsea. It was an amazing French bakery that sold loads of treats that they bake fresh on the premises. It got my mind wondering and I came away thinking about opening up something similar one day in my hometown! Who knows! Nothing to report on the home front as our sale still moves forward at a slow pace; however, the most important thing is this one is still moving forward! I’m just hoping when it comes to May’s write-up we have a date set to move in! As far as fitness goes, I had a great month and Tom has been pushing me hard; however, I want to get fully focused on it again this month as business distractions took me a little off my plan in April. Enough about me though, what have you been up to?